Have you heard of Tsum Tsums? First of all, let me start off this post by saying it isn't sponsored. I'm writing this because I had a bad purchase experience, which actually ended up turning into something extremely lovely. Let me back up. Last weekend I was shopping for a birthday present for one of Ellie's friends at a store I won't name. There was a promotion at the time on toys where if you bought one thing, you could select another toy for 50% off. I thought, she's been well behaved and they look cute, so I bought her a pack of Tsum Tsum Squishy figurines (Tsum Tsum roughly means 'stackable' in Japanese). She chose Cinderella, and there was a mystery one included that you could only see when you opened the pack. Hooray (for my Frozen obsessed threenager), she'd gotten Anna! Except well, Anna has no eyes. When I took this picture, I'd bought it a few hours previously, so I hardly think that she could have possibly played with it enough to wear off the eyes already. Cue disappointed threenager, throwing appropriate threenager sized tantrum. As we couldn't see Anna when we chose the pack, I admit to being sad and disappointed myself, and figured head office would like to know that there was a possible faulty batch out there. I also planned to take Anna back to the store and swap her over. I had a quick google, and (although I didn't purchase it from them), wrote to Tsum Tsum Australia to let them know what happened, and to give them the feedback about product quality. What happened next is a lovely experience. I got a reply saying that Tsum Tsum Australia aren't associated with Disney, they are just a passionate parent who decided to import official Tsums themselves after having trouble purchasing them online. They don't stock the Squishys on their site but advised me to take it back to the place of purchase for a refund, and went on to say they wished they had an Anna to offer as compensation for me. I wrote back saying, thank you for the information, I did intend to take my purchase back and thank you for responding. I also said the offer was lovely and appreciated, but unnecessary, especially given I didn't purchase it from them. I said that I would make an order through them later though as Ellie had by now become Tsum Tsum obsessed and they obviously knew their Tsums. To cut to the chase. 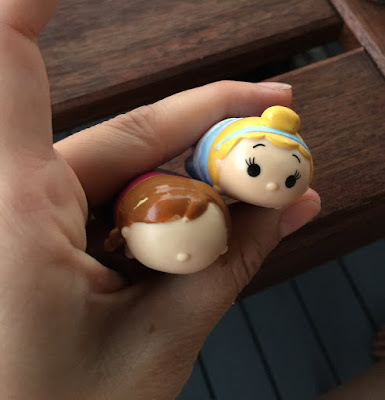 I arrived home on Wednesday to find an envelope in my letter box with a tiny Marie (from the Aristocats) Tsum inside, and a note saying that they hoped this made up for a disappointing prior experience. They had tracked down my address from the contact form submission and sent an official fluffy Tsum Tsum out of the goodness of their heart! Marie is not plastic like the Squishy, but tiny, fluffy and a very cute stuffed toy. Look at her! She even has a fuzzy tail (you can see some of the fluff in the picture below, as well as on her head). That is customer service, above and beyond, for someone who wasn't even their customer. It made mine, and most certainly Ellie's day too. So, if you ever want to expand your Tsum Tsum collection, and you want something that is authentic, from a business who is passionate about quality and service, may I suggest you look to Tsum Tsum Australia, for all your cute, stackable needs!